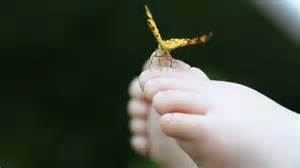 Did you know that butterflies use their feet to taste? Imagine if that were true for humans. What would we taste when we run through a field of lavender? Or the taste of warm, rich soil, the saltiness of the beach... Ah, well, just a little bit of whimsy on my part. Of course, this has gotten me thinking about our feet. Those very peculiar things at the bottom of our legs. Strange as they are, our feet are actually extraordinary. Leonardo da Vinci called them a masterpiece of engineering and a work of art. I always notice people's feet. Our feet actually say a lot about us. Reflexologists will be able to tell us what a vital role the feet play in our overall health profile. Reflexology is the application of pressure to certain reflex areas, especially on the feet, but also on the hands and ears. Some studies have found that reflexology may alleviate pain and help lessen symptoms of anxiety and even depression. It can help people to relax and sleep better. We seldom think about our feet, we mostly take them for granted. Yet they are more than just a way of getting us from point A to point B, and definitely more than a display of the latest footwear trends. Whether we use them to walk, dance, jump or run, they leave behind footprints. Our feet usually take us exactly where our hearts desperately want to go. It is important that we look after our feet, that we cherish them. Feet are mentioned 262 times in the New International Version of the Bible. In the Bible, we see that clean feet were very important. There are many references to the washing of feet. One of the examples we find in Gen. 18:4 "Let a little water be brought, and then you may all wash your feet and rest under this tree". Our feet have a purpose. At times our feet are followers (Job 23:11 "My feet have closely followed his steps; I have kept his way without turning aside"), obedient and hard working. They are long-suffering. At times they are leaders, showing the way, guiding others to new destinations (Luke 1:79 " to shine on those living in darkness and in the shadow of death, to guide our feet into the path of peace.") Sometimes our feet are pioneers, cutting a path where there has not been one before. In Romans 10: 15 we see that the feet of those who bring the message of the Gospel, are beautiful. It is also important that we wear the right footwear; our feet must be "fitted with the readiness that comes from the gospel of peace" (Eph. 6:15) . Look at your feet right now. What do you see? Is your one foot bigger than the other one, maybe your toes look a bit like Niknaks, or maybe you have perfectly manicured feet. No matter what they look like, they are worth to be celebrated. Be careful where you go, when you look behind you, you might just find that somebody has been following in your footsteps. Now ask yourself this question: Are you happy with the place where you have led them to...? You are amazing, Charri! Maybe I don't need to write a comment every time, but I can't stop myself :) You echo so precisely many of my own thoughts and things that are important to me. Feet, yes! I have always loved walking barefoot, be it in the sand on the beach when I lived in California, or in the grass when I go camping in the summer in Russia. Now I have the opportunity to walk barefoot outside every day - the first thing I do in the morning is walk out barefoot into my garden and step through the dewy grass. This means I have to tend to my feet more to keep them clean. Oh, it is ALWAYS so nice to hear from you!!! I appreciate it, and value how we resonate with each other. May you have a blessed walk through the fields this week! * Oops, I did it agian!! !